Sadly, this aired on Samurai TV which means they squeezed all of these matches into two hours. Most of the wrestlers on the card have a profile on Joshi City, you can click on their names above to go straight to it. The shows starts with what is basically a televised training session with Jaguar Yokota. Yokota needs no introduction – she is one of the best Joshi wrestlers of all time but also a trainer as well, a literal living legend to be sure. Manami is 12 years old and just debuted in April, so this match is just about one of the greatest Joshi wrestlers ever showing the rookie a thing or two to hopefully assist her as her career goes forward. They tie-up to start, Jaguar pushes Manami into the ropes but she gives a clean break. She does the same thing the second time, Manami asks Jaguar to lock knuckles but she elbows the legend instead. Three dropkicks by Manami sends Jaguar to the mat, but Jaguar sneaks in an inside cradle for two. Side headlock takedown by Jaguar, Manami gets out of it but Jaguar puts pressure on her legs before applying a crab hold. Manami gets to the ropes to force a break, rolling front headlock takedown by Jaguar and she puts Manami in a body scissors. Jaguar picks up Manami and applies a wristlock, Manami reverses it but Jaguar takes her back to the mat with a side headlock takedown. Chinlock by Jaguar but Manami gets out of it and applies a hammerlock, Jaguar reverse it back however and picks Manami back up off the mat. Manami sneaks in a backslide for two, Jaguar slaps her but Manami catches Jaguar with a dropkick. Two more dropkicks by Manami and another, but Jaguar stays on her feet. Finally Manami knocks Jaguar over, cover by Manami but Jaguar easily kicks out. Jaguar picks up Manami and elbows her in the chest, scoop slam by Jaguar and she hits a somersault legdrop for two. Double underhook suplex by Jaguar, but Manami gets a shoulder up on the cover. Elbows by Jaguar, Manami returns fire but Jaguar puts her in the Cobra Twist and Manami submits! Your winner is Jaguar Yokota. As I figured, this was mostly just Jaguar helping to teach Manami how to chain wrestle and things like that. It went longer than you’d expect, over eight minutes, I guess Jaguar wanted to give the 12 year old an extended session. Technically solid since its Jaguar, but a pretty normal rookie vs. veteran match. Any match with Eiger is a match one shouldn’t take too seriously. Eiger is a ghost zombie of sorts, similar to the character in The Ring, and is mostly a comedy wrestler. Hana is a champion over in Stardom but here she is not as evil as she is in Oedo Tail, generally wrestling as a face. Rydeen in a Pure Dream wrestler who is still working her way up the card there in her 4th year as a pro. We join this in progress, with Eiger doing her bit with Hana while Rydeen tries to tell Hana where Eiger is. Rydeen throws the referee at Eiger to free Hana, Rydeen and Hana both attack Eiger but she rolls under their lariat attempt and hits a DDT onto Rydeen. She then DDTs Hana as well, Eiger gets on the second turnbuckle while Rydeen hits Hana with a shoulderblock. Rydeen elbows Hana while Eiger returns, Eiger falls on top of Hana but Rydeen breaks up the cover. Waistlock by Rydeen by Eiger, Eiger reverses it but Hana rolls up Rydeen from behind for two. Hana rolls up both of them for another two count, she goes off the ropes but eats a kick from Rydeen and Eiger. Chokeslam by Eiger to Hana, Rydeen Irish whips Eiger but Eiger stares at her. Hana dropkicks Rydeen on top of Eiger, and Rydeen picks up the three count! Rydeen Hagane wins! This was heavily clipped, which is fine. Eiger is funny, I enjoy the bit but I don’t need to see it for too long. A decent enough comedy match but I wish that Hana Kimura could have had a bigger match, seemed like a bit of a waste of her skills. If you like Eiger, a non-offensive way to spend four minutes but that’s about it. Gaijin Invasion! Heidi has been pretty active in Japan the last six months and is the current REINA-CMLL International Champion. Alex we know well since she floats around a lot of promotions, her biggest role at the moment is part of Ozaki Army in OZ Academy. On the other side, Aasa is a young wrestler from Gatoh Move, while KAORU is a long time veteran and a regular in Sendai Girls’. Probably nothing more than a fun midcard match but the potential is there for something fun. We join this match in progress as Lee covers Aasa, she picks her up and knees Aasa repeatedly in the head. Kicks the Lee but Aasa returns with a dropkick, more dropkicks by Aasa and she covers Lee for two. Lee knees Aasa but Aasa hits a back bodydrop, scoop slam by Aasa and she covers Lee for two. Aasa tags in KAORU, KAORU comes in with her board and hits Lee in the head with it before hitting a vertical suplex. The referee won’t count the pin due to shenanigans, KAORU puts Lee in front of the corner and pretends like she is going to drop the board onto her, but she jumps down and hits Lee in the head with it instead. Lee comes back with knees, jumping knee by Lee in the corner and she hits a double underhook suplex for two. Lee picks up KAORU but Aasa runs in and hits her from behind, Lee breaks through the double team and kicks both of them before hitting a double face crusher. Kick by Lee, and she covers KAORU for two. Lee tags in Heidi, elbows by Heidi and she hits a butterfly suplex for a two count cover. Lee comes in but Aasa does too and knocks Lee out of the ring, cradle by KAORU to Heidi and she hits Heidi with the board. KAORU goes up top but Heidi grabs her from behind, she goes for a powerbomb but KAORU reverses it with a hurricanrana. She hits Heidi with the board before tagging in Aasa, running body blocks by Aasa and she covers Heidi for two. Aasa goes off the ropes but Heidi kicks her in the stomach, Giant Swing by Heidi and she covers Aasa for two. Over the shoulder slam by Heidi, but KAORU breaks up the cover. Lee throws KAORU out of the ring and tries to kick Aasa, but she nails Heidi in the head by accident. KAORU then tries to hit Heidi with the board piece but hits her own partner by mistake, Heidi runs up to Aasa but Aasa cradles her for two. Aasa goes off the ropes but Heidi hits a hard shoulderblock, Heidi slams Aasa in front of the corner and Lee comes off the top with a diving footstomp. Heidi then goes to the second turnbuckle and delivers the Diving Guillotine Drop, and she picks up the three count! Alex Lee and Heidi Katrina win! I’ve only watched a few matches with Heidi but I continue to be impressed with her. I haven’t seen her yet in a big singles match but she always looks good in tag matches. This was the best I’ve seen Alex look as well, so while the match was clipped she looked more natural than in the past. Aasa still has a ways to go and KAORU was mostly gimmick here, so I wouldn’t say it was a high end match or anything, but a perfectly watchable midcard tag. These teams seem a bit lopsided. I don’t think I even need to say much about the veteran team, as it is stacked with three of the top current Joshi wrestlers with dozens of title reigns between them. The other side has three talented but very young wrestlers, led by Mika Shirahime from Sendai Girls’. Mio Momono and Rin Kadokura are both on loan from Marvelous, which is a smaller promotion run by Chigusa Nagayo. The question here isn’t which team is winning, but rather how much of a fight can the young team put up. The match begins with Rin against Nanae, Nanae tosses Rin around the ring and throws her into the corner before hitting a series of chops. Lariat by Nanae, she picks up Rin but Rin Irish whips her only to eat a shoulderblock. Takedown by Nanae but Rin gets out of it and both women return to their feet. They tag out as Mika and Meiko come in, they trade kick attempts until Meiko lands one to the midsection. Meiko tosses Mika to the mat and puts her in a side headlock, Mika gets out of it but Meiko slams her back into the corner and applies a front headlock. Mika suplexes out of the hold and they both return to their feet, tagging in the last pair of wrestlers. Mio looks so tiny next to Kong, she goes for elbows but Kong pushes her back and asks for Mika. Mika tags in, Kong knees her in the midsection but Mika avoids her charge and delivers a head kick. Mika tags Rin, they go for a double suplex but Kong reverses it and suplexes both of them. Kong tags in Meiko, jumping elbow by Meiko in the corner and she rebounds out of the opposite corner with another elbow to the face. Backdrop suplex by Meiko to Rin, but it gets a two count. Elbow drop by Meiko but Rin avoids her elbow and rolls her up, dropkick by Rin but Meiko follows with a heel kick. Meiko tags Kong back in, knees by Kong to Rin and she hits a series of dropkicks, but Kong doesn’t budge. Kong throws Rin into the ropes but Rin hits a hurricanrana, picking up a two count pinfall. Kong punches Rin in the face for her troubles, she goes for a lariat but Rin ducks it and jumps on Kong’s back. Kong drops down with a Samoan Drop, Irish whip by Kong but Rin tags in Mio. Rin and Mio hit a double dropkick to send Kong to the mat, they then take turns back and forth dropkicking Kong. Kong eventually gets tired of this and hits a hard lariat on Mio, she picks her up but Mio pushes her away and goes for a sunset flip. Kong blocks it by sitting on Mio, backdrop suplex by Kong but Mio gets a shoulder up on the cover. Kong tags in Nanae, hard elbows by Nanae but Mio fires back. Dropkick by Mio but Nanae delivers a jumping kick to the head, she drops Mio onto her knee but Rin breaks up the cover. Meiko comes in to take care of Rin but Mika hits a crossbody onto Nanae, missile dropkick by Rin and Mio covers Nanae with a bridge for two. Mika is tagged in and she dropkicks Nanae in the corner, Nanae and Mika trade elbows, kicks to the chest by Mika but Nanae hits a hard shoulderblock. Nanae charges Mika but Mika kicks her in the chest, vertical suplex by Mika and she covers Nanae for two. Mika goes up top but Nanae recovers and joins her, superplexing Mika back into the ring. Nanae tags in Meiko, uppercut by Meiko to Mika and she kicks Mika in the back of the head for a two count cover. Meiko kicks Mika against the ropes but Mika delivers a superkick, she picks up Meiko but Nanae and Kong run in. Kong cleans house but accidentally lariats Meiko as well, footstomp by Mio onto Meiko and Mika suplexes Rin on top of Meiko. Mika goes up top and hits a diving crossbody, but Kong breaks up the pin by hitting Mika with her metal tin. Team Meiko hits a suplex on all three of their opponents, Nanae goes up top while Meiko puts Mika on her shoulders, but Mika ducks her dive and cradles Meiko for two. Jackknife cover by Mika, but that gets a two as well. High kick by Mika, she goes off the ropes but Meiko connects with a high kick of her own. Cartwheel kneedrop by Meiko, she drops Mika with the Death Valley Bomb and picks up the three count pinfall! Meiko Satomura, Aja Kong, and Nanae Takahashi win! Shida and Syuri have been dominating the tag team division since they first started tagging up last fall. They won the Sendai Girls’ Tag Team Championship on November 23rd, 2016, and this is their fourth defense of the titles. It is actually their third defense against this very tag team, as Miyagi and Chisako have been trying to become the tag champions for awhile. Maybe the third time is the charm for the Sendai Girls’ team and they can bring the titles back to the promotion. Miyagi and Chisako attack before the match starts, and the action immediately spills outside the ring. Miyagi puts Shida against the railing and hits a cannonball, while Chisako grabs a chair and hits Shida in the head with it. Syuri tries to help but is ultimately unsuccessful, Miyagi brings Shida into the ring before draping her over the ropes so she can hit a missile dropkick. Chisako comes in too and they double team Shida, Chisako covers Shida but it gets a two count. Shida goes off the ropes but Syuri trips her form the floor, Shida drags Chisako’s head over the apron and delivers a running knee. Shida tags in Syuri, kicks to the chest by Syuri, stomps by Syuri and she tags Shida back in. Tilt-a-whirl backbreaker by Shida and she puts Chisako in a crab hold, Shida release her so that she can hit another backbreaker. Syuri returns and goes for Chisako’s arm, she gets the cross armbreaker applied but Chisako gets a foot on the ropes for the break. Syuri tags Shida back in before hitting an ax handle off the top turnbuckle, as Chisako continues being the Face In Peril. Well she isn’t really a face, its an interesting dynamic. Miyagi finally helps out her partner and gets the hot tag, dropkicks by Miyagi to Syuri and she covers her for two. Another dropkick by Miyagi, she picks up Syuri but Syuri gets her back and hits a Backstabber. PK by Syuri, and she makes the tag to Shida. Jumping knee by Shida in the corner, she sets up Miyagi in the corner and then suplexes Chisako onto Miyagi. Miyagi and Shida trade elbows and eye pokes, Syuri grabs Miyagi from the apron but Chisako grabs Shida in return. Shida gets her kendo stick but Miyagi stops her from using it, they both go for it but Miyagi gets it first and hits Shida in the head with the kendo stick. Air Raid Crash by Miyagi, she goes up top and delivers a missile dropkick for two. Miyagi tags in Chisako, running elbow by Chisako in the corner but Shida joins her when she goes up top. Miyagi comes in and throws Shida back to the mat, assisted diving senton by Chisako to Shida but the cover only gets a two count. Chisako picks up Shida and hits a Northern Lights Suplex but Shida comes back with an enzuigiri, vertical suplex by Shida and she delivers a running knee for a two count. Shida tags in Syuri, kicks to the chest by Syuri and she hits a jumping knee in the corner. Suplex by Syuri, but Chisako kicks out of the cover. Syuri quickly applies a cross armbreaker but it gets broken up, Shida comes in the ring but Chisako dropkicks both of them out of it. Miyagi gets in the ring and dives out onto Shida and Syuri, Chisako then goes up top and jumps down onto both of them as well. Chisako slides Syuri back in and she is double teamed in the corner, diving footstomp by Chisako but Syuri gets a shoulder up on the cover. Chisako goes back up top but Shida runs in and smacks her, Shida suplexes Chisako down to the mat and with Syuri they take turns kicking her. Double kicks to Chisako, but Syuri’s cover gets a two count. Syuri holds Chisako for Shida, Chisako ducks Shida’s kick but Miyagi hits Chisako by accident and Syuri hits a release German on her. Running knee by Syuri to Chisako, but the cover gets two. Kicks by Syuri but Chisako catches one and hits her, boot to the face by Chisako and Miyagi runs in to hit a big boot. Chisako goes up top and nails the Hormone Splash, but Shida breaks up the cover by throwing a kendo stick at her. Chisako goes off the ropes but Syuri hits a jumping knee, they trade elbows until Syuri kicks Chisako in the head. Cover by Syuri, but Miyagi breaks it up. Shida comes in and hits Miyagi in the head with the kendo stick, then she and Syuri hit running knees on Miyagi and Chisako. Syuri goes for the Buzzsaw Kick by Chisako ducks it, Harumaru by Chisako and she picks up the three count! Cassandra Miyagi and DASH Chisako are the new champions! Main event time! Chihiro Hashimoto has had an interesting year, to say the least. She won the Sendai Girls’ Championship last year on October 16, lost it to Aja Kong on January 9th. Then she won it back on April 6th, lost it to Hiroyo on June 10th, and here she is trying to win it back a third time. Part of the issue is that Sendai Girls’ has a very small roster, so they don’t have a lot of challengers. But their last match was really good and I am confident they will deliver, even if their current path is a bit repetitive. They start slow as they trade holds on the mat with neither getting a clear advantage. They go into a Test of Strength, Hiroyo wins the battle and chops Chihiro into the corner. Chihiro boots Hiroyo back and slams Hiroyo back into the corner, body avalanche by Chihiro and she hits hip attacks in the corner. They trade elbows, scoop slam by Hiroyo but Chihiro hits a jumping hip attack. Hiroyo falls out of the ring but Chihiro waits for her, Hiroyo rolls back in and pushes Chihiro against the ropes before slapping her in the face. Chihiro elbows Hiroyo but Hiroyo elbows her back, Hiroyo wins the duel and throws Chihiro out of the ring. Hiroyo goes out after her and throws Chihiro into the ring post, vertical suplex by Hiroyo out on the floor and she returns to the ring to wait for Chihiro. Chihiro makes it back in after a moment, Hiroyo tries to suplex her over the ropes but Chihiro blocks it and they trade elbows while Chihiro is on the apron. Shoulder tackle by Chihiro, she goes up top but Hiroyo joins her and hits a superplex. Cover by Hiroyo, but it gets two. Hiroyo goes for the powerbomb but Chihiro blocks it, Hiroyo rolls it into a crab hold instead, she then applies a Texas Cloverleaf but Chihiro gets to the ropes for the break. Hard elbow by Hiroyo but Chihiro slides around her back and plants her with a release German. Chihiro picks up Hiroyo and gets her on her shoulders, rolling fireman’s carry slam by Chihiro and she delivers the somersault senton for a two count. Chihiro goes back up top and nails a somersault senton, but Hiroyo gets a shoulder up on the cover. Chihiro grabs Hiroyo around the waist but Hiroyo gets into the ropes, hard lariat by Hiroyo but Chihiro comes back with a spear. Hiroyo goes for a backdrop suplex but Chihiro blocks it, lariat by Hiroyo and she hits the sliding lariat for a two count. Hiroyo picks up Chihiro but Chihiro again blocks the backdrop suplex so Hiroyo hits a German suplex hold instead for two. Front suplex slam by Hiroyo, but again her cover gets a two count. Hiroyo drags up Chihiro but Chihiro drives her into the corner, Hiroyo slides around Chihiro however and delivers a sitout powerbomb. Hiroyo hits a series of short range lariats, she goes for the backdrop suplex but Chihiro gets out of it with a judo toss. Chihiro applies a Cobra Twist but Hiroyo gets into the ropes, Chihiro keeps Hiroyo locked up however and suplexes her to the mat. Powerbomb by Chihiro, but Hiroyo kicks out of the cover. Roaring elbow by Hiroyo but Chihiro ducks the next one and hits a release German, Hiroyo returns to her feet but Chihiro lariats her back to the mat again. Another lariat by Chihiro, she drags up Hiroyo and nails the German suplex hold for the three count! Chihiro Hashimoto is the new champion! 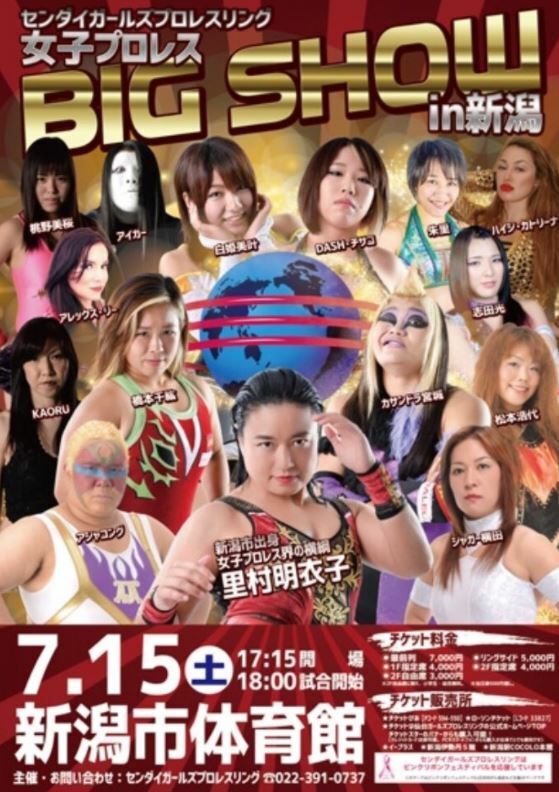 When Sendai Girls’ puts on a big event, they don’t mess around. While the first three matches being clipped down for the broadcast hurt it a bit, the last three matches all delivered (or over-delivered). The Veteran vs. Young Stars tag match was a template on how to do that style of match, I just loved it and Aja Kong elevated it to another level. The tag title match had two ‘real’ tag teams, not individuals thrown together, and that led to a really tight and well-worked match. The main event was fantastic as Chihiro continues to grow, even though her constant title wins are a bit odd it has really put her on another level as now I can see her pairing up evenly against any other wrestler in Joshi. A really entertaining show by Sendai Girls’ with multiple matches I’d definitely recommend tracking down.